FORTA® Corporation introduced synthetic fiber reinforcement to the U.S. concrete market in 1978. 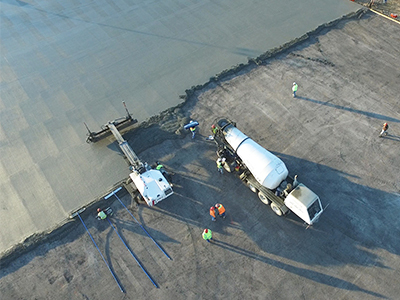 The first of its kind in the industry, FORTA offered a variety of fiber characteristics – shape, length, chemistry, and dosage – to perform at varying levels of crack control in many concrete applications, especially the popular slab-on-ground application. FORTA’s line of macro synthetic fibers has been used in traditional stab-on-ground applications all around the world with proven success. Generally, short monofilament (angel-hair) fibers have been used at a dosage of 1.0 lb. per cubic yard to reduce plastic shrinkage cracking prior to the concrete’s initial set. Heavier fibrillated (net-shaped) fibers have been used at a higher dosage of 1.5 lbs/cu. yd. to reduce plastic and hardened concrete shrinkage cracking and add durability as a viable alternative to conventional temperature steel such as wire mesh. These fiber types, including those supplied by FORTA®, have enjoyed scores of successful flatwork project applications for over 30 years. Visit some of our project pages below and read about some examples of our fibers at work in real world applications. The success of FORTA’s macro synthetic fibers can be clearly witnessed in projects across the country.